We use synthetic rooting hormones when we propagate plants. Some propagators don’t. They feel that natural hormones, or auxins, abundant in the growing tips of plants will promote root growth. 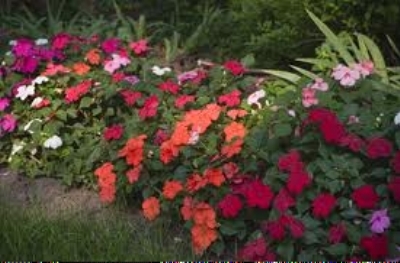 As a matter of fact, many herbaceous plants — angelonia, bacopa, coleus, cuphea, impatiens, and petunia, to name a few, are easy to root because they have an ample supply of this natural hormone. For us, synthetic hormones are insurance policies for rooting success. Natural hormones begin to deteriorate once a stem is removed from home base, and some plants are just too difficult to root without a boost from synthetics. 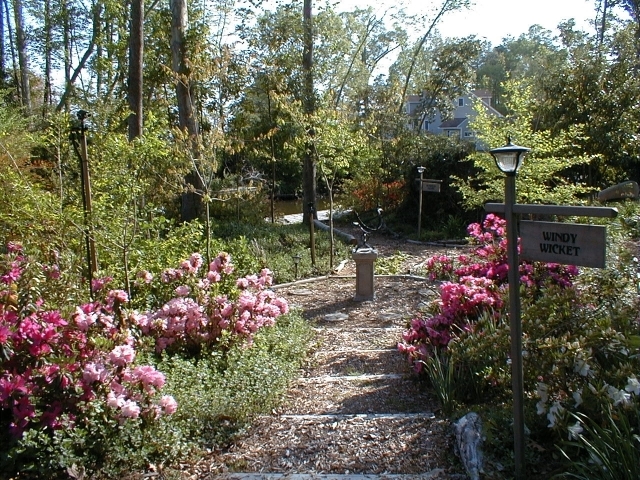 In fact, some plants cannot be propagated by stem cuttings at all. There are concerns that because these hormones are, after all, growth hormones, they may be carcinogenic. They can also irritate skin and eyes. Fortunately, the quantities we use are so small and dilute that EPA considers danger from exposure to be minimal. Still, it’s good policy to be cautious around any chemical. We try to avoid contact with skin, but cuttings are so delicate I find it difficult to handle them if I wear gloves. When we began propagating plants, we used Rootone, a powder that contains the hormone NAA (naphthaleneacetamide) and a fungicide, Thiram, that helps prevent damping-off of stems. 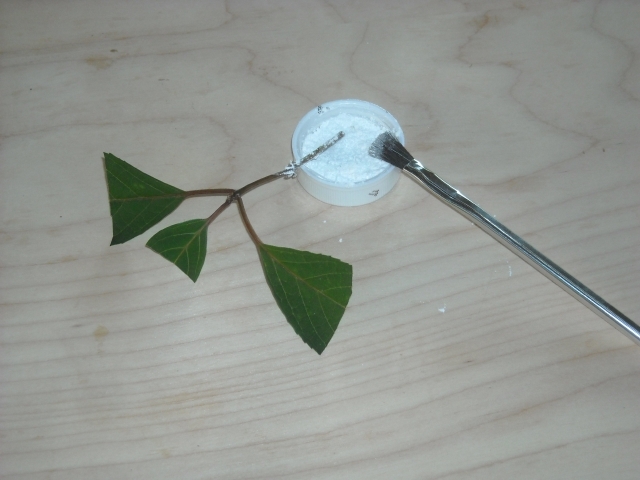 We found that rooting response with Rootone was generally inconsistent, possibly because it was difficult to apply evenly to the stem, possibly because not enough of it remained on the stem after sticking the cutting into soil. 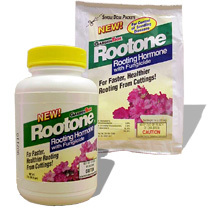 However, many gardeners we know use Rootone and are happy with their results. Snip N Dip, a powder by Hormex, contains the hormone IBA (indole-3-butyric acid), no pesticides or fungicides. It can be purchased in six different strengths, from weak to strong, depending on what you are rooting. We do not have experience with this powdered hormone, which can be purchased in small quantities reasonably priced on-line or in some retail nurseries. Hormex also sells a liquid hormone available on-line with Vitamin B1 added to promote healthy root growth. From the Hormex site you can navigate to a lively blog on propagation, Garden Mama. If you use the powder, put a small amount in a shallow cap (jelly-jar caps work well). Dip the cutting into the powder, or brush the powder on with a small inexpensive disposable glue brush. Shake off the excess leaving only a thin film. Contamination can occur if you dip directly into the original container. For the same reason, unused powder should not be returned to the original container. 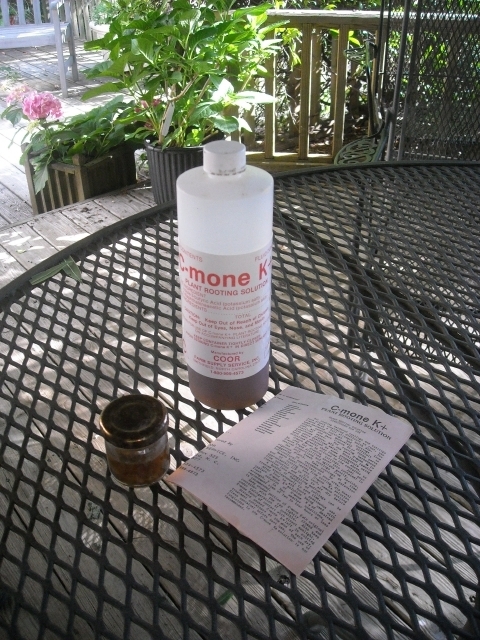 After we attended a couple of Master Gardener classes on propagation, we switched to a liquid rooting hormone. 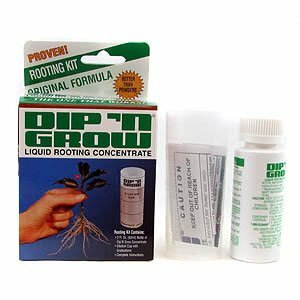 Dip n Grow is a liquid rooting concentrate that contains a combination of two hormones, IBA and NAA. Alcohol is added as a carrier, and Naphthalene, a wetting agent, promotes rapid absorption. 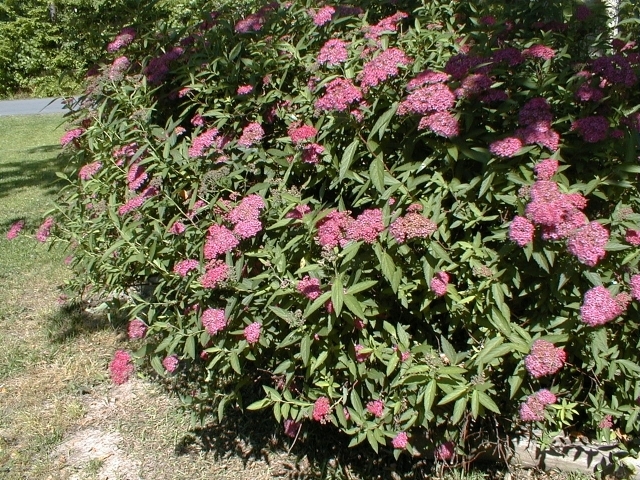 The product is known as a quick-dip because cuttings are dipped for only one to three seconds. It is difficult to find retailers and distributors locally, but you can order Dip n Grow on-line from the company or from Amazon. Dip n Grow is offered in gallon and pint sizes, and now in a two-ounce kit, a more reasonable size for the occasional propagator. Dip-Gel is an interesting new product that purports to boost rooting success. We have no experience with it but would like to hear from anyone who has used it. Another quick-dip liquid hormone is C-mone K+. It has essentially the same properties as Dip n Grow and is less expensive but is used with smaller rates of dilution. It is available in pints and sold by Coor Farm Supplies in Smithfield, NC, 1-800-999-4573. Neither of these liquid hormones have a fungicide. You can add the fungicide Captan to solutions, though it is not recommended for C-mone K+ solutions. We don’t use fungicides because, of all the garden products on the market, fungicides are among the most dangerous. We don’t know any gardener-propagators who use them when rooting cuttings. Correspondingly, Dip N Grow uses a dilution rate of 1:20 for softwood, 1:10 for semi-hardwood, or 1:5 for hardwood. We prepare the hormone solution just before taking cuttings and dip stems as soon as they are prepared and before the cut begins to heal. Since the hormone is relatively expensive, we make up small amounts and use small, low jars with lids. Disposable paper or plastic cups will work, but they are lightweight, they tip easily, and they cannot be sealed. We bundle stems and dip several at a time to about a half-inch. Very little hormone is used up, even during busy times, but it is nevertheless discarded. We never dip cuttings into undiluted hormone in the original container. Contamination is too likely. We store undiluted, unused hormone in its original, labeled container in the refrigerator. Color darkens with age, but its effectiveness lasts for at least two years as long as it is not exposed to heat and light. Rooting hormones are merely one part of the balancing act in low-tech propagation. Happily, it is the easiest to control.